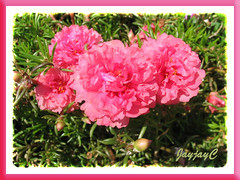 Portulaca grandiflora, a sun-loving annual succulent! 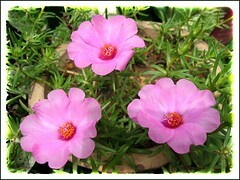 Common Name: Portulaca, Moss Rose, Rose Moss, Sun Plant. Plant type: A flowering annual succulent, native to southern Brazil, Uruguay and Argentina. Light: Full sun for best growth and flowering. Moisture: Performs well with regular watering though can tolerate dry and hot conditions as well. Do allow soil to dry out between waterings. Soil: Grows best in well-drained sandy or gravelly soil. Propagation: Easily propagated by pinching off the Portulaca stems into 2-4 inches length, stick them directly into moist, sandy or loamy soil and locate them in a sunny area. Portulacas can also be propagated from seeds that are as tiny as dust, so mix the seeds with sand before sowing to make them easier to scatter, then rake in. 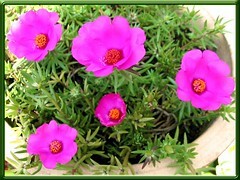 And, Moss Rose readily self-seeds too in hot climates – what a bonus! 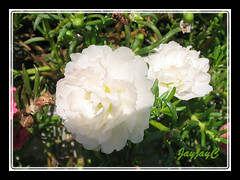 Features: Portulaca grandiflora is a low growing plant with a height of about 4-8 inches (15-20 cm) and a sprawling spread of 12-14 inches (30.5-35.5 cm). This fast growing and sun-loving annual succulent is multi-branched with brownish-red succulent stems and bright green leaves that are cylindrical, fleshy and pointed at the tips. Its ephemeral flowers are about an inch to 3 inches (7.6 cm) across, borne singly on terminal stems and come in many bright colors of rose pink, red, yellow, orange, purple, white or multi-colored with stripes or spots. It can be in single form, double or multi-petalled like the rose. Flowers open every morning in the sunshine and closes in the afternoon, night or on cloudy days. The inch-wide flowers of the older cultivars close in mid afternoon to reopen in the morning, while the newer ones with larger flowers stay open longer in the afternoon to late evening, closing at night and on downcast days. 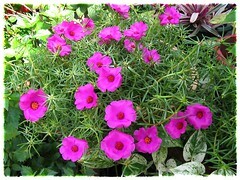 Usage: Portulaca grandiflora is most ideal as ground cover for dry areas and rock gardens or sunny borders and beds, especially if planted with a mix of various cultivars to present a carpet of colors. It is fantastic as a hanging basket plant with its trailing branches and colorful blooms cascading over the basket or pot. Excellent too for container gardening or planter boxes, placed at balconies, window sills, patios and decks. Being very tolerant of hot and dry conditions, it is most suitable to be planted on slopes or between pavers and along driveways, sidewalks or roadsides. Care: Ross Moss are such tough and fuss-free annuals, almost thriving on neglect. Locate them where there is full sun and with sufficient watering, they’ll delight you with a continuous profusion of colorful blooms all year round or all summer long. Dead-heading is not required at all, though you may want to harvest seeds for next year’s planting or pinch off spent flowers to encourage flowering. Feed once in a while. 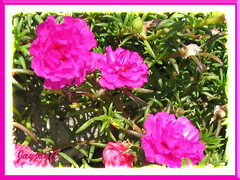 Portulacas are relatively pest and disease free! For temperate zones: Hardiness – USDA Zone 5-11. More information here. Hi Robin! Most of our container plants that can take full sun (exclude the shade-loving foliage plants) are already listed in our plants database and clicking on their names will lead you to their profile+images, which can guide you in choosing your own preferred plants. 2) flowering plants such as Adenium obesum, Allamanda, Alpinia, Bauhinia, Bougainvillea, Brunfelsia, Caesalpinia, Calliandra, Carphalea, Crossandra, Cuphea, Duranta, Euphorbia milii, Heliconias, Ixora, Lantana, Loropetalum, Melampodium, Nerium, Plumbago, Rhododendron, Ruellia, Wrightia, Zephyranthes, and of course Portulaca too. Cactus and Hibiscus are sun-lovers too, but not included in our database as yet. All the pictures of Portulaca above are perennial portulaca commonly found in Malaysia, they are not annual portulaca and all the varieties name you using are belong to annual type portulaca series ‘Sundial’ . 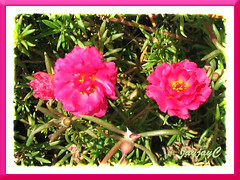 Perennial type portulaca will not normally procude seeds but the annual type will and it will self seeding as well, this type of annual portulaca are not that hardy to grow in our wet climate. I am not sure have u found the below plant ID? Here the name for you. Thanks a lot for taking the trouble to share your much appreciated thoughts. It appears that there’s much conflict online as to whether Portulaca grandiflora is an annual or perennial with the majority voting it as an annual. So we’ll just leave it as an annual. Even the naming of images seen in many websites are contradictory. We will definitely be editing this article when I can find the time to do more research online and most probably decide to omit the cultivars’ name as it’s not easy to nail their correct ID by just comparing images. Re Gypsophila muralis, yes someone had helped ID our image at Flickr. Thanks.